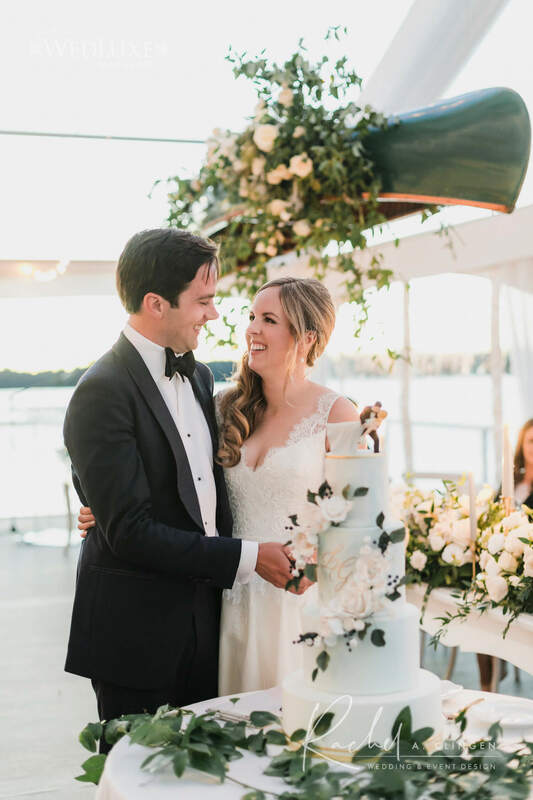 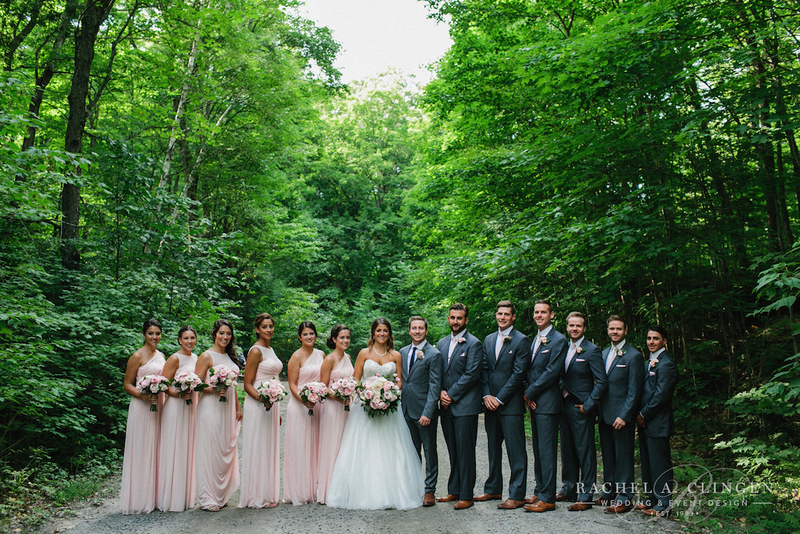 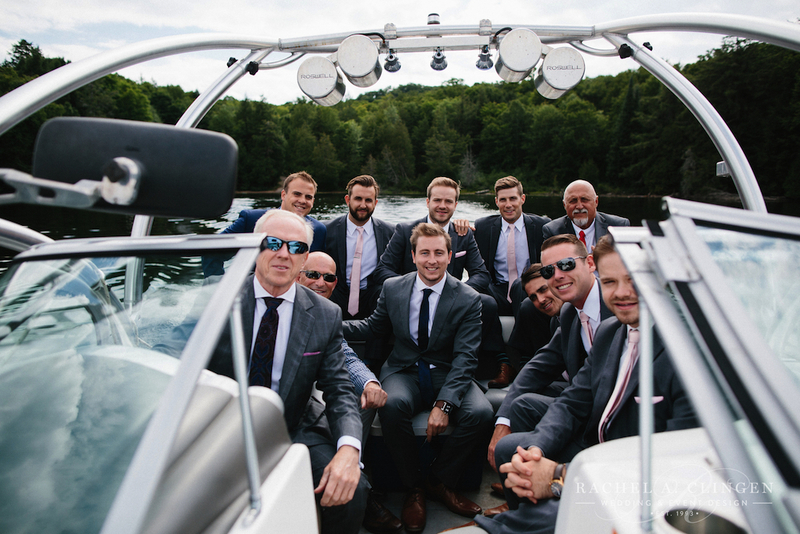 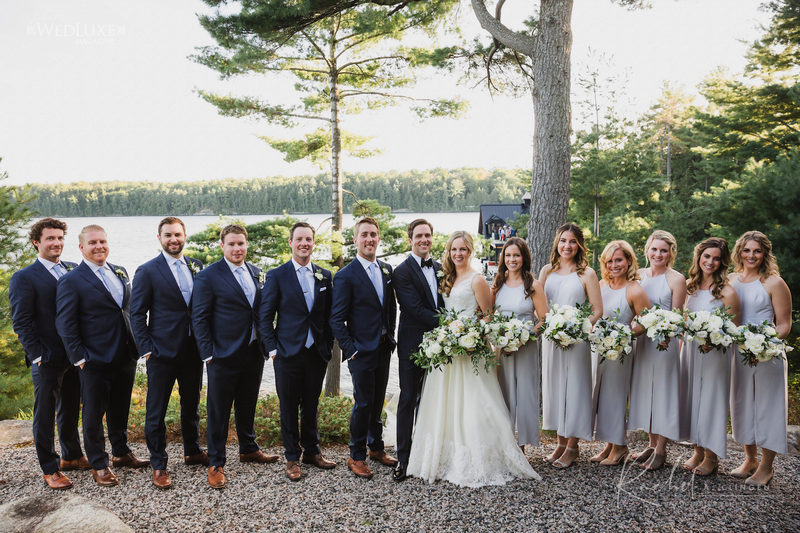 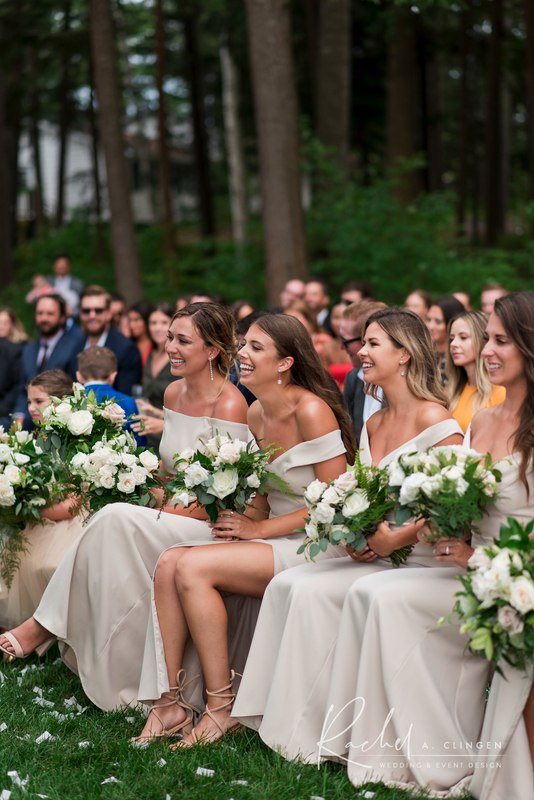 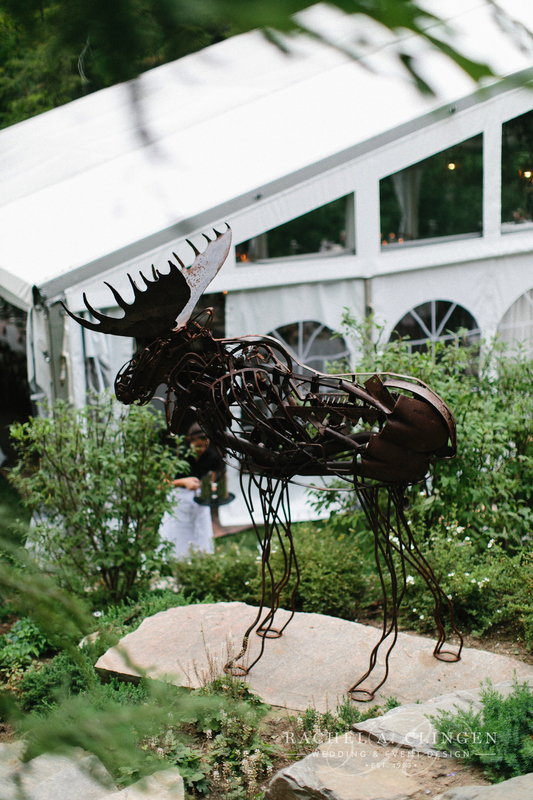 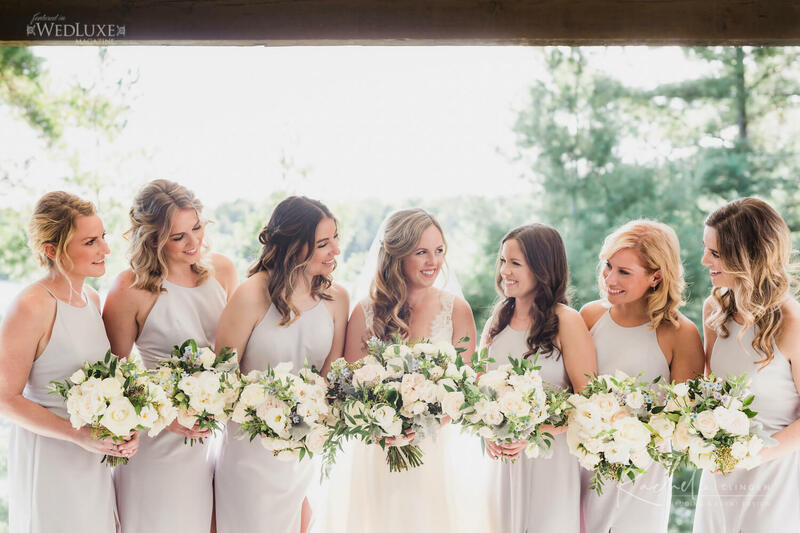 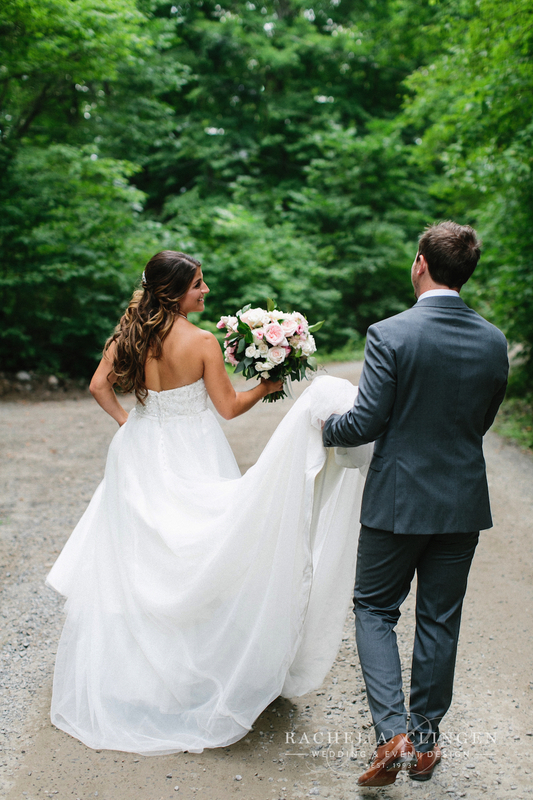 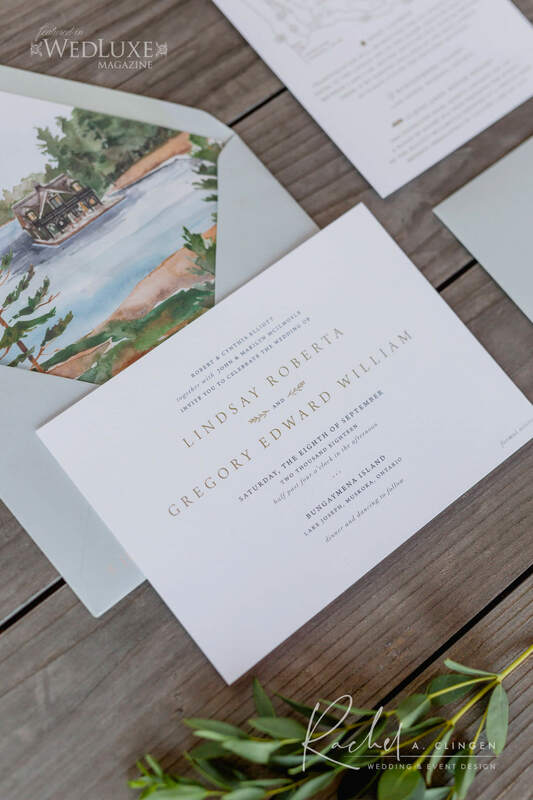 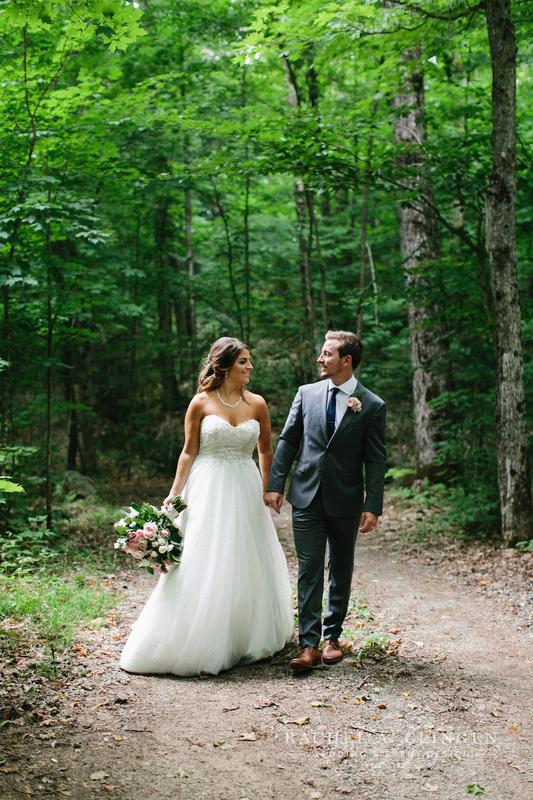 Lyndsay and Greg’s beautiful Muskoka tent wedding on Lake Joseph took rustic romance to a new level. 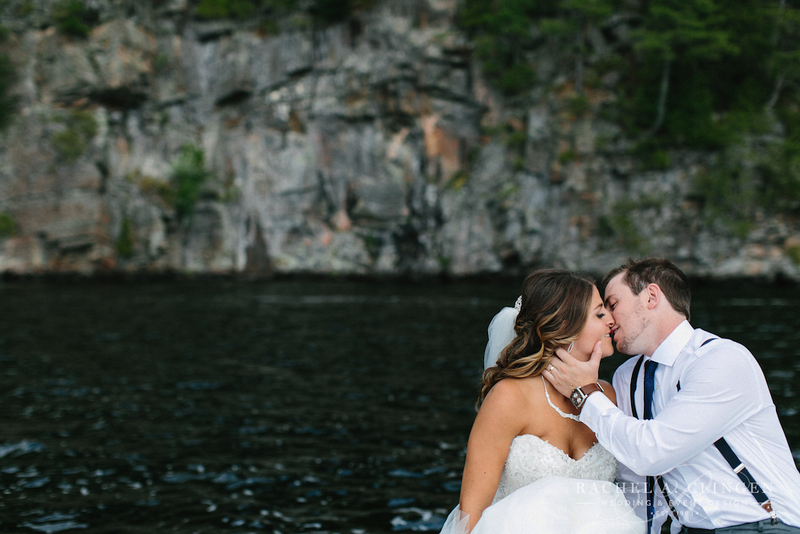 The couple celebrated in style on a private island owned by the brides family. 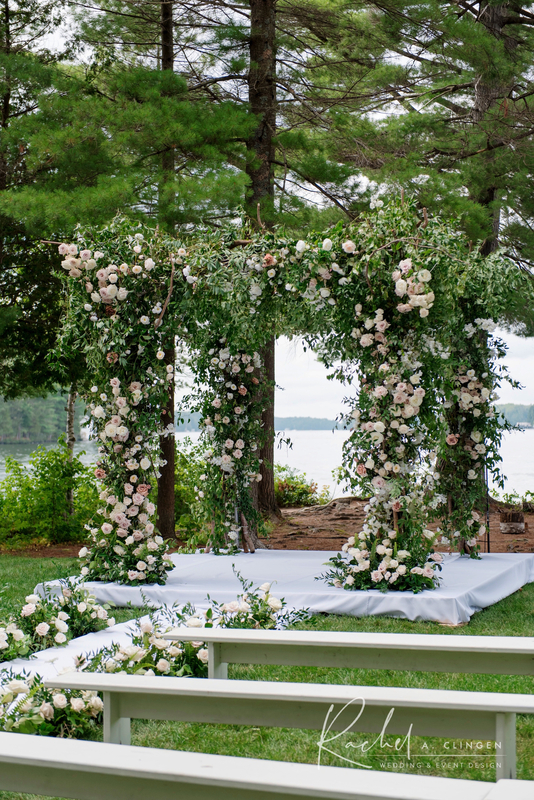 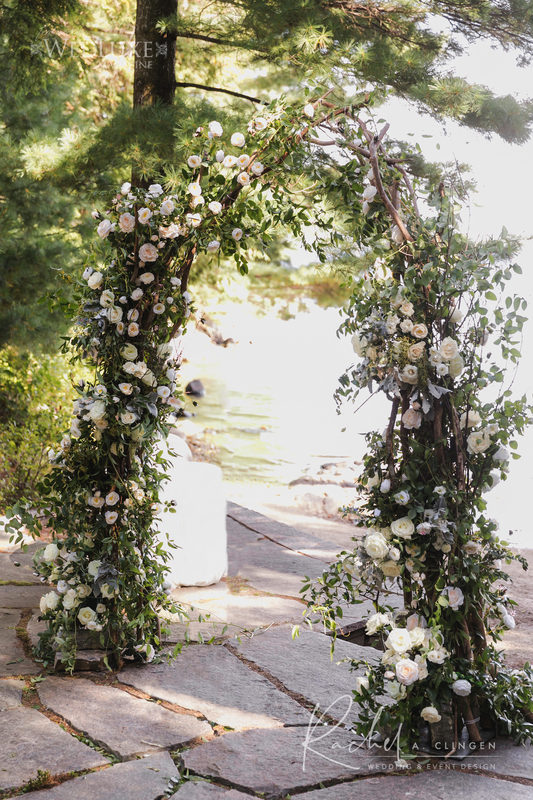 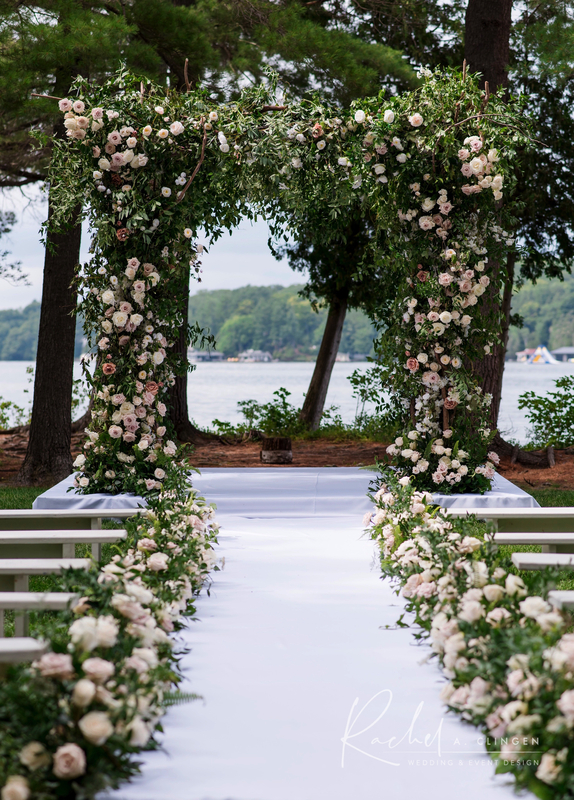 We constructed a pretty floral arch which marked the spot for the ceremony on their private beach, however, various elevations and rugged terrain made erecting the clear top tent for the reception, on the island difficult. 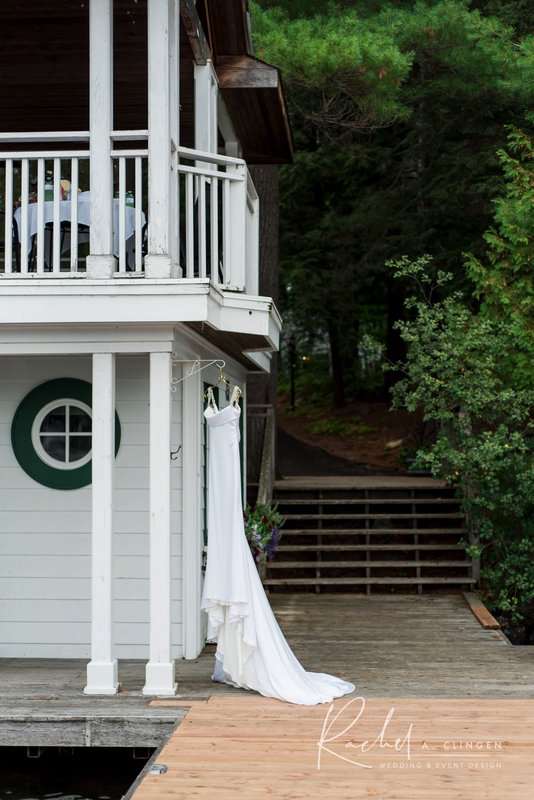 This was not a deterrent to host their wedding day at this special spot. 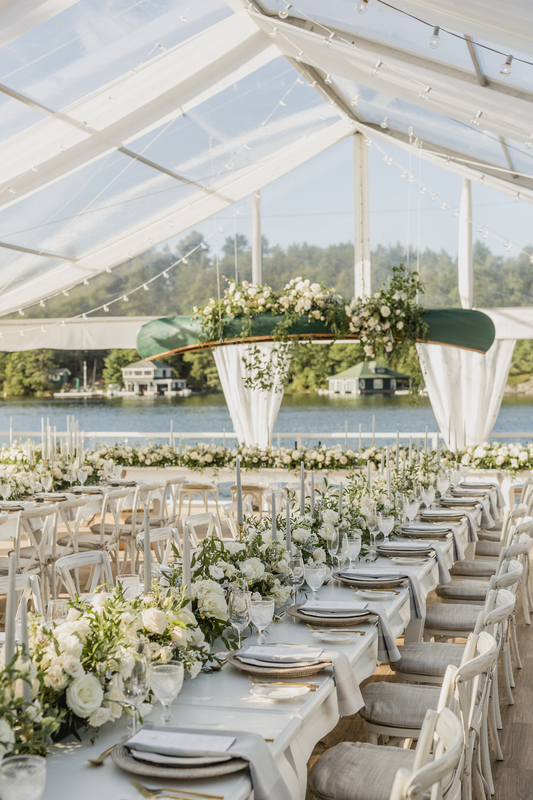 Collaborating with engineers and barge company, Premier Tents was able to build the tent on a floating barge! 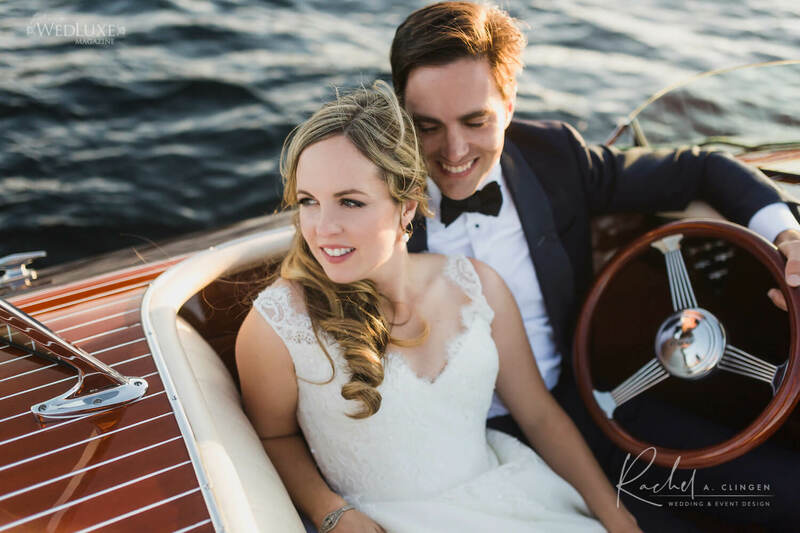 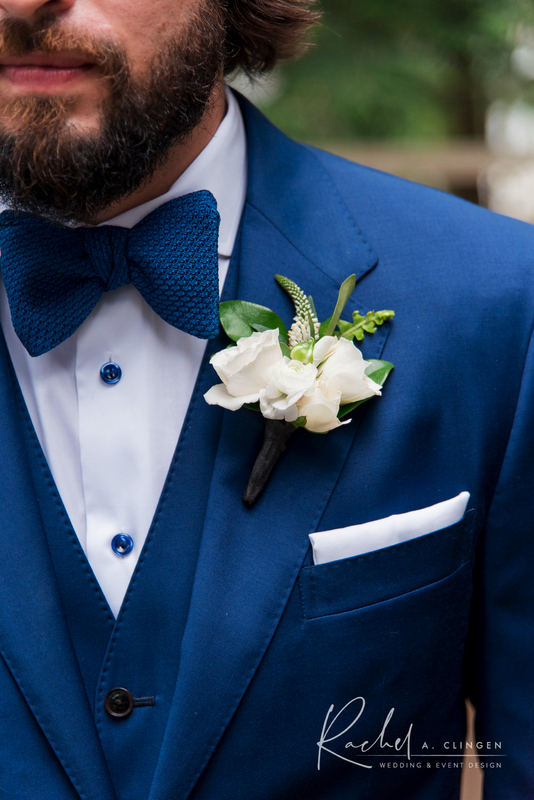 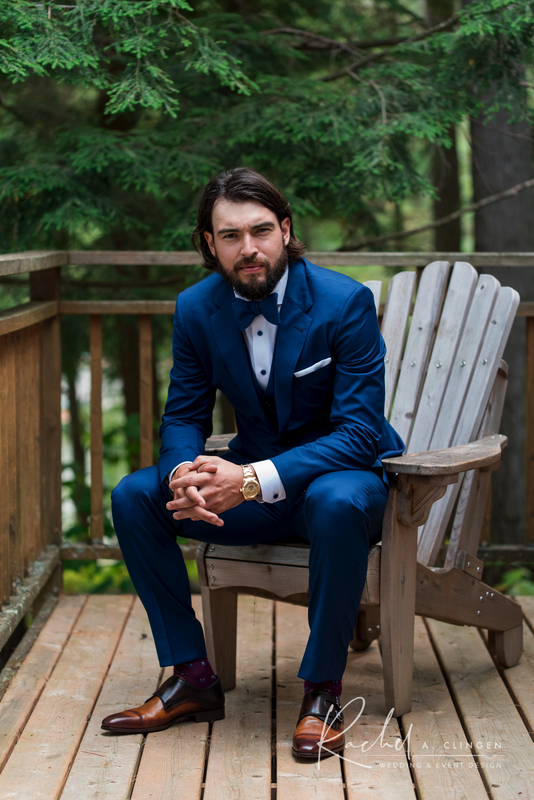 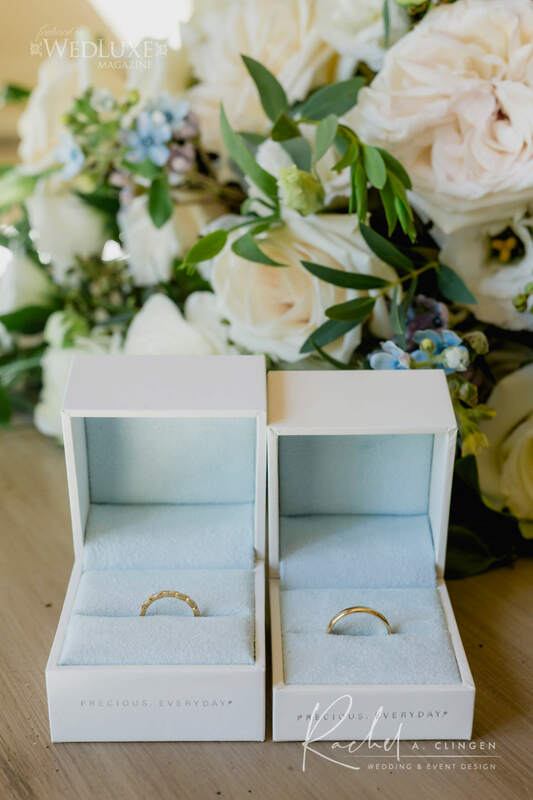 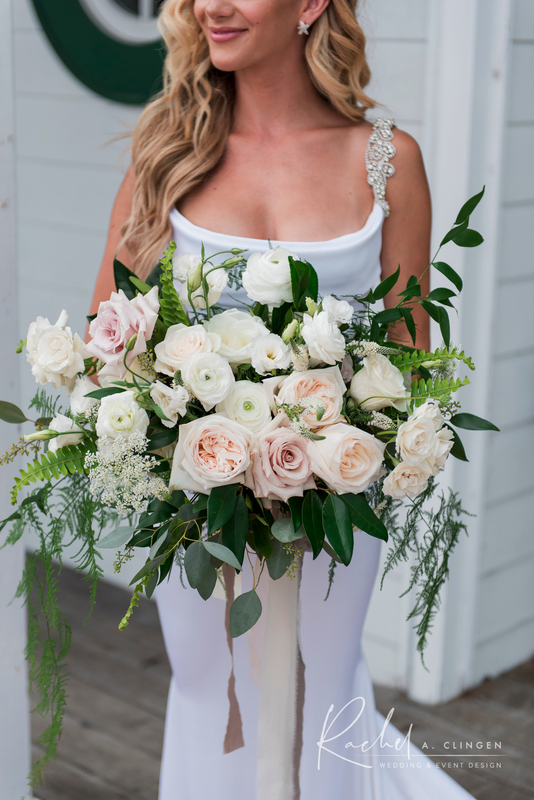 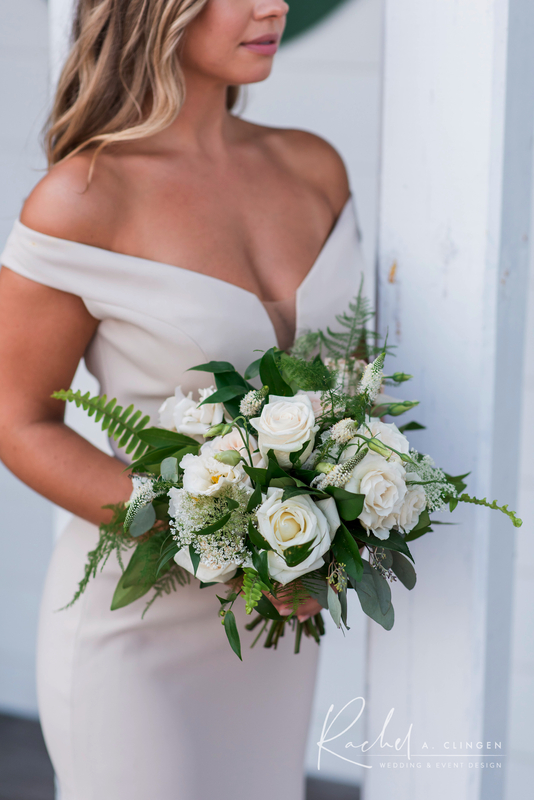 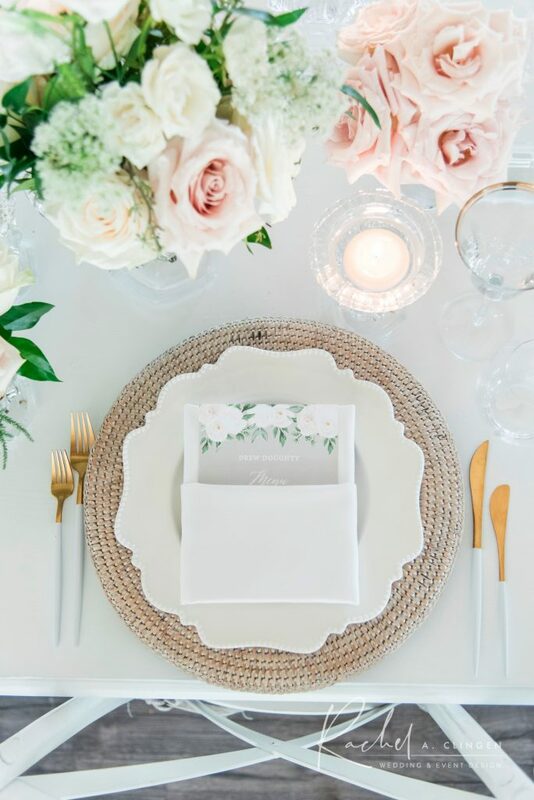 Collaborating with the amazing wedding planner Ashley Pigott, of Toronto, and a list of other vendors, our team handled the logistical challenges of transporting all goods to the island with ease. 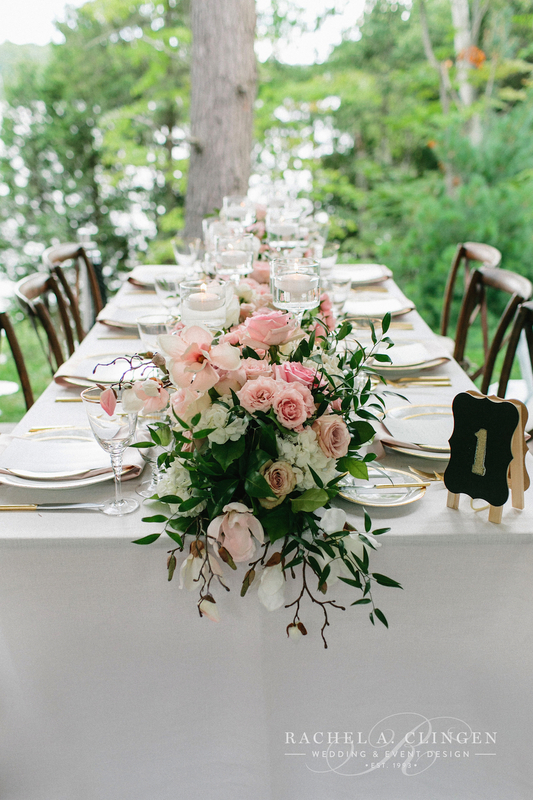 Guests dined over looking Lake Joseph and enjoyed dinner and dancing as the sun set on the Muskoka horizon. 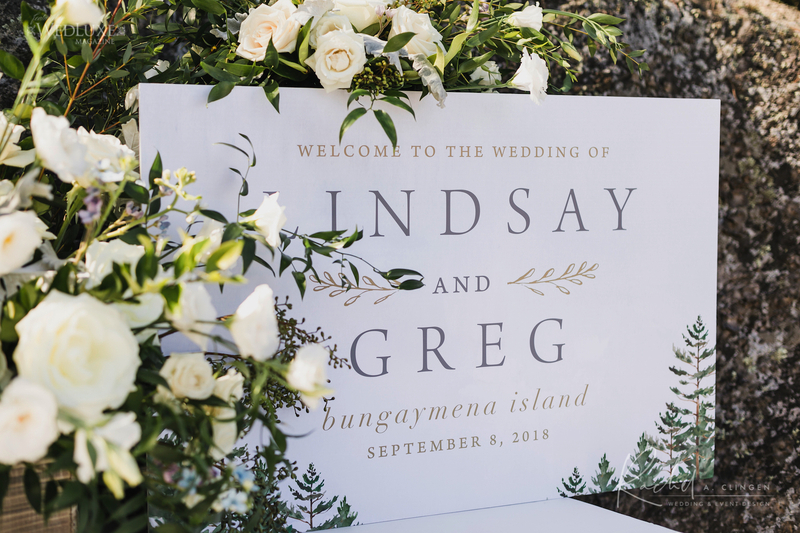 Congratulations Lyndsay and Greg! 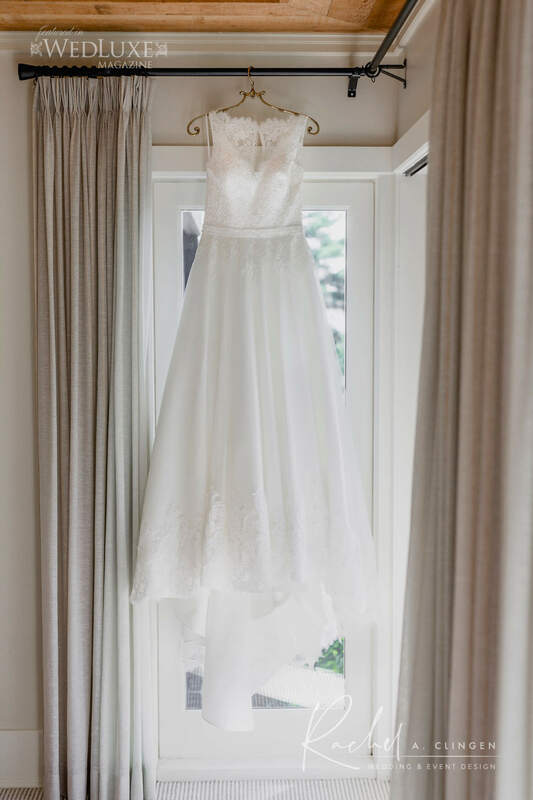 Thank you for trusting us with your special day! 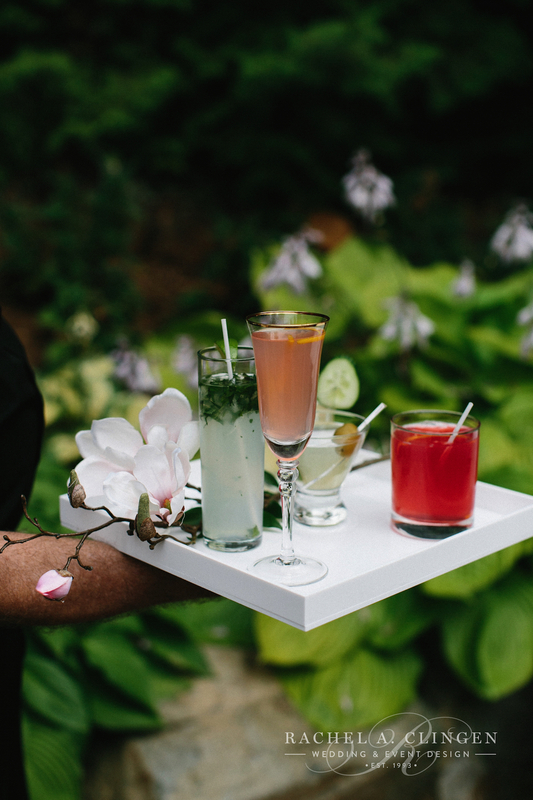 For a complete list of vendors see bottom of post. 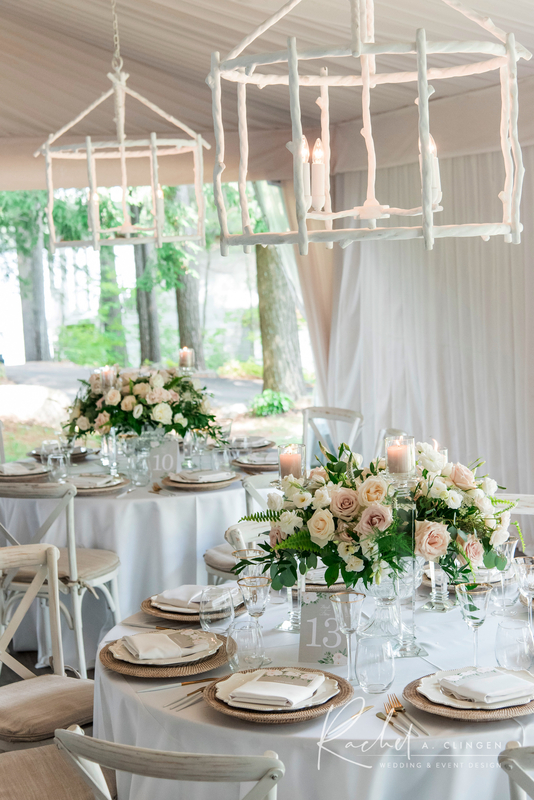 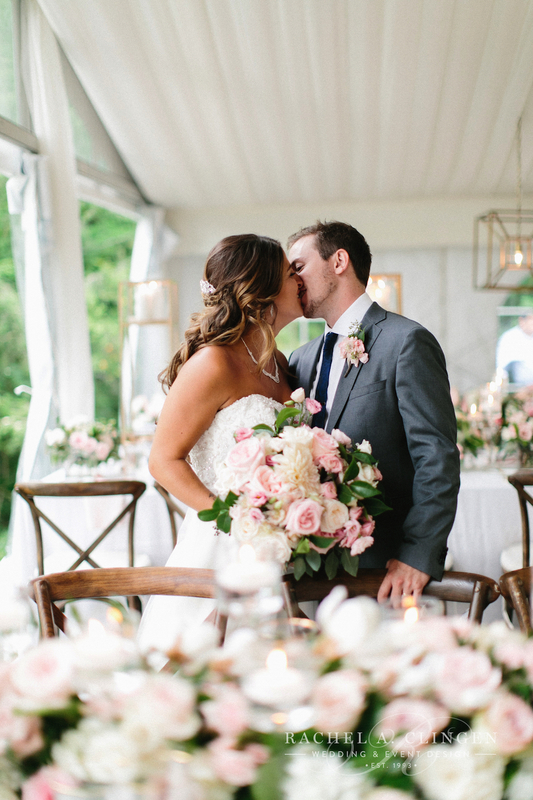 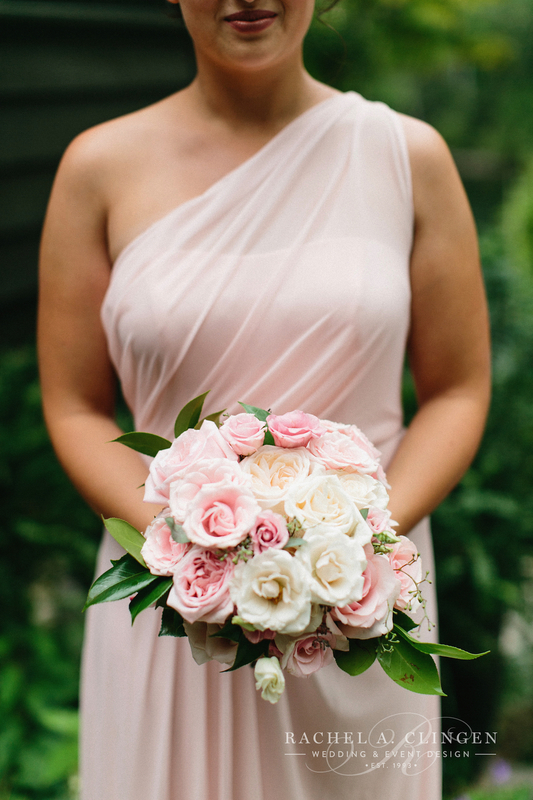 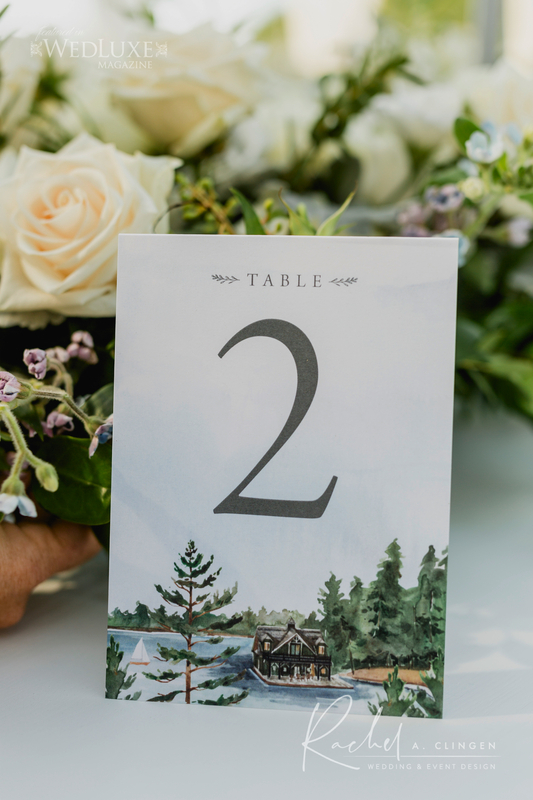 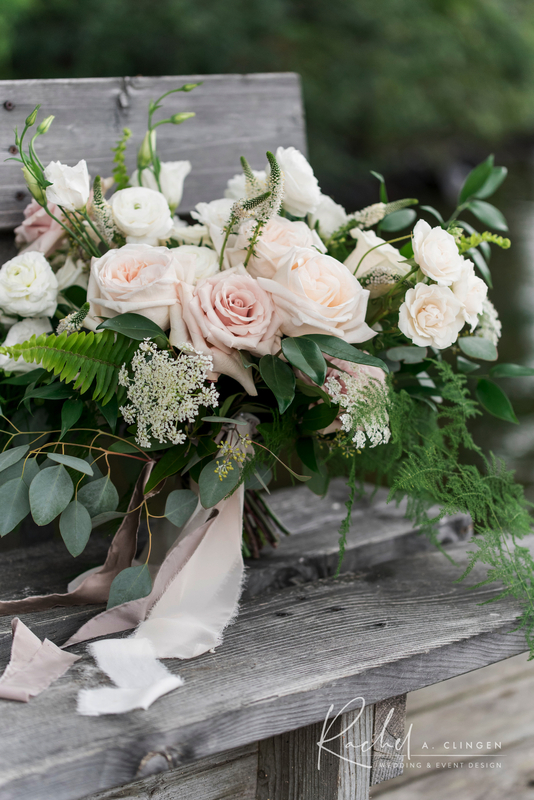 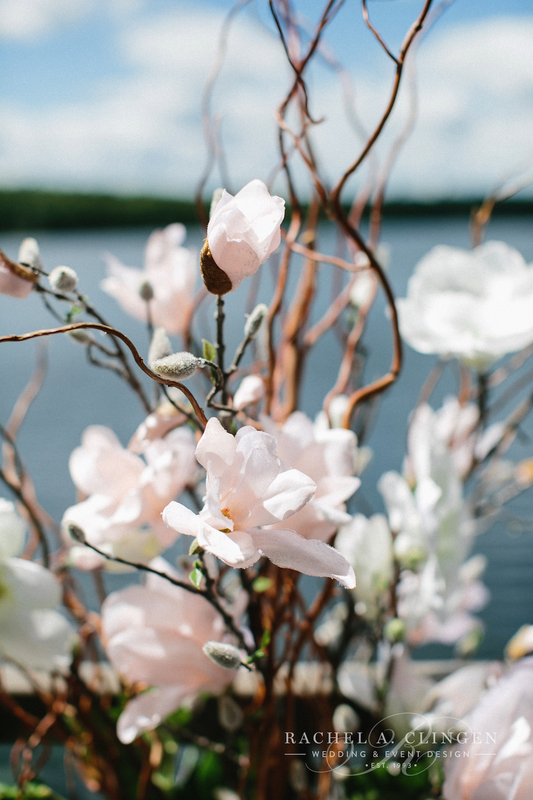 It was all about rustic elegance and pretty magnolias for Lisa and Chris’s beautiful Muskoka tent wedding. 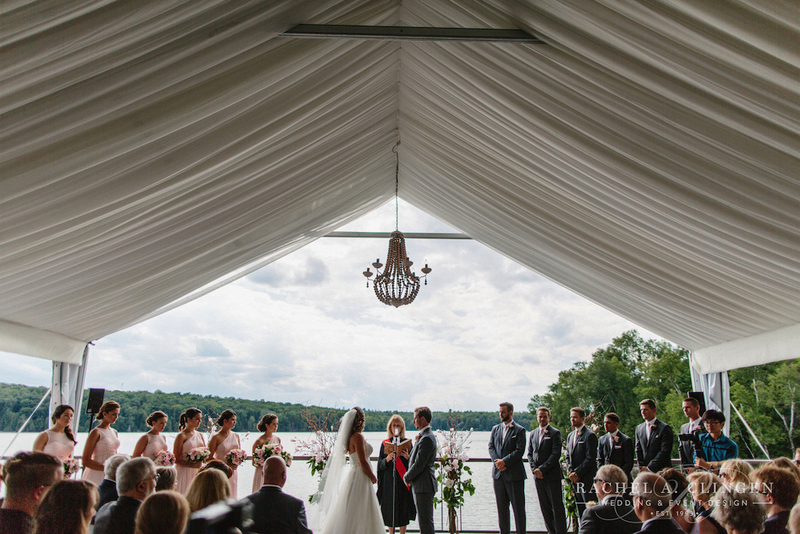 The couple chose the family cottage to host friends and family to an intimate and beautiful tented wedding. 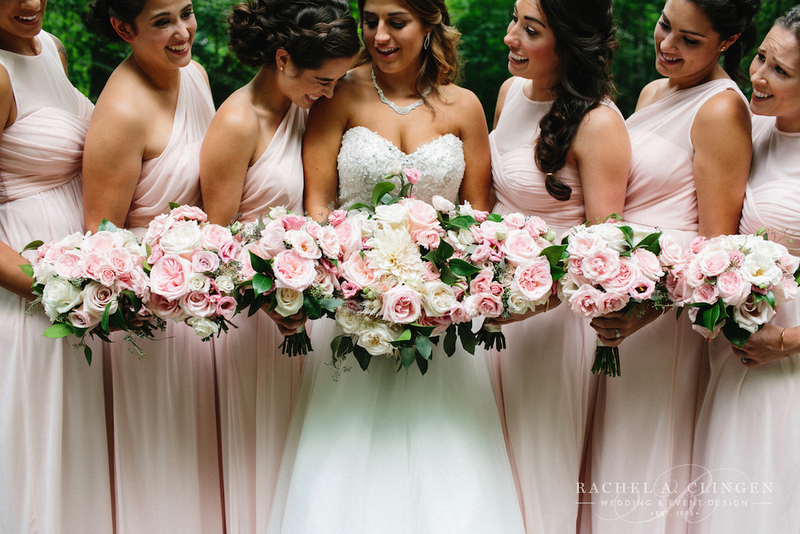 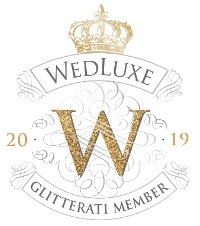 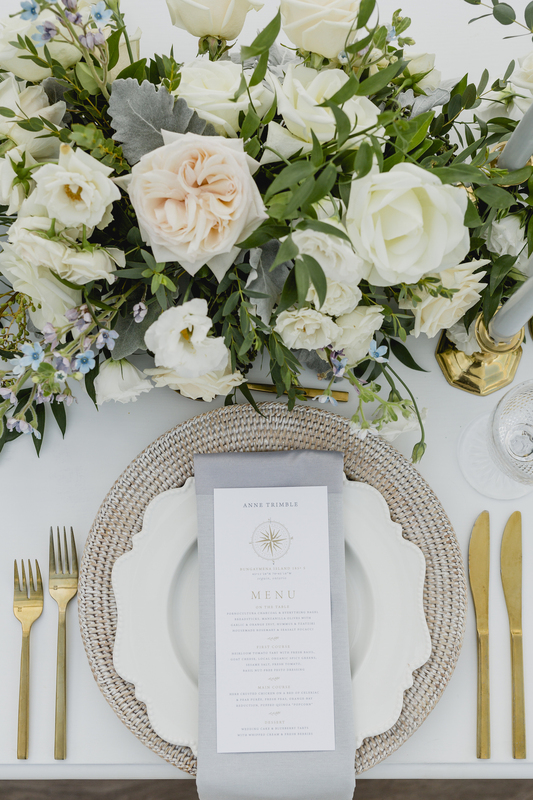 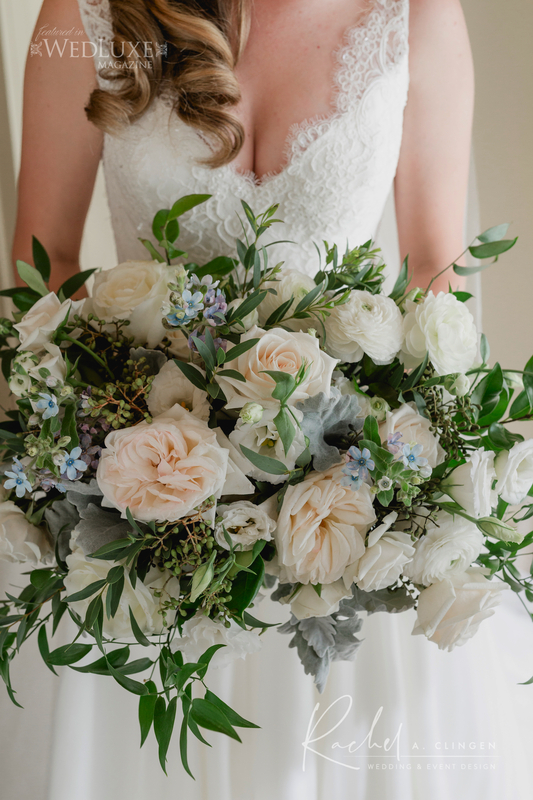 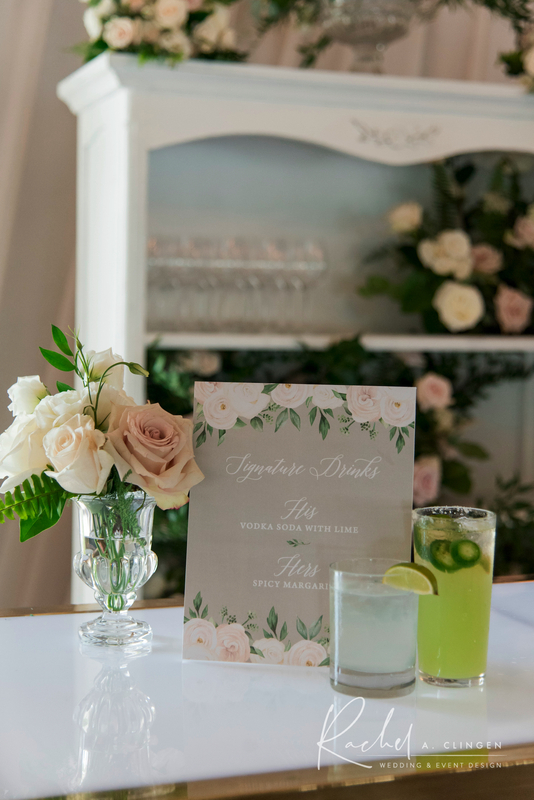 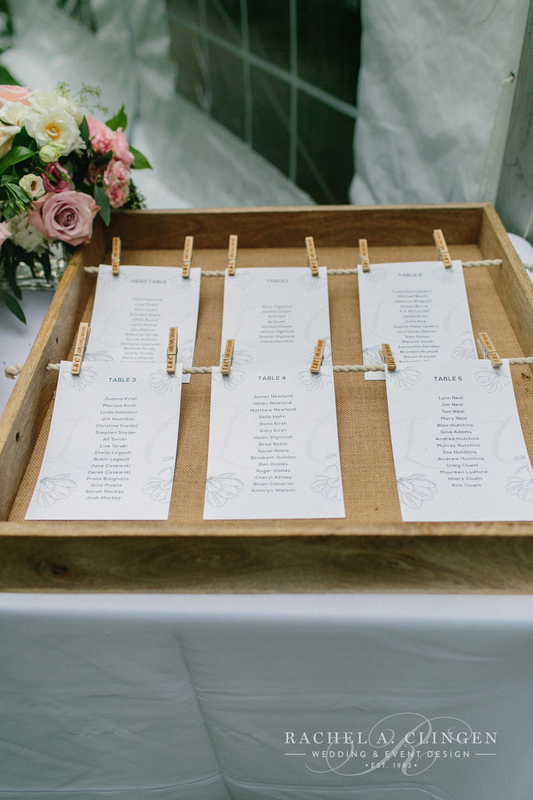 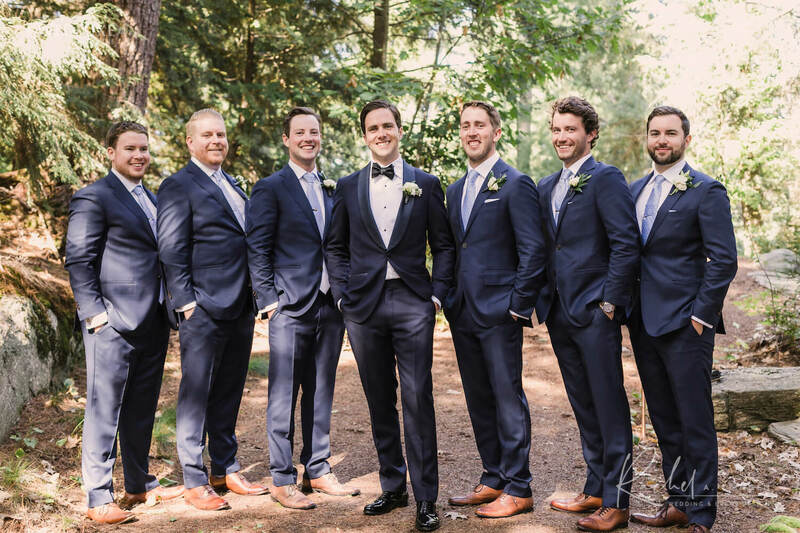 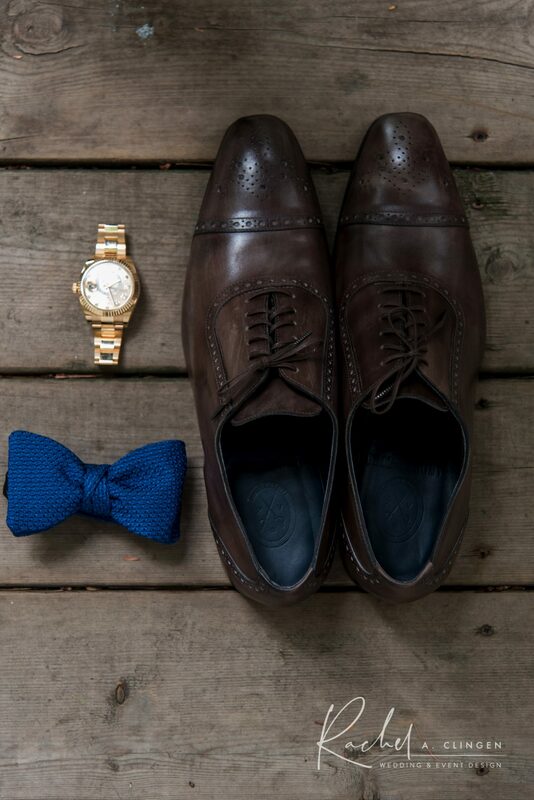 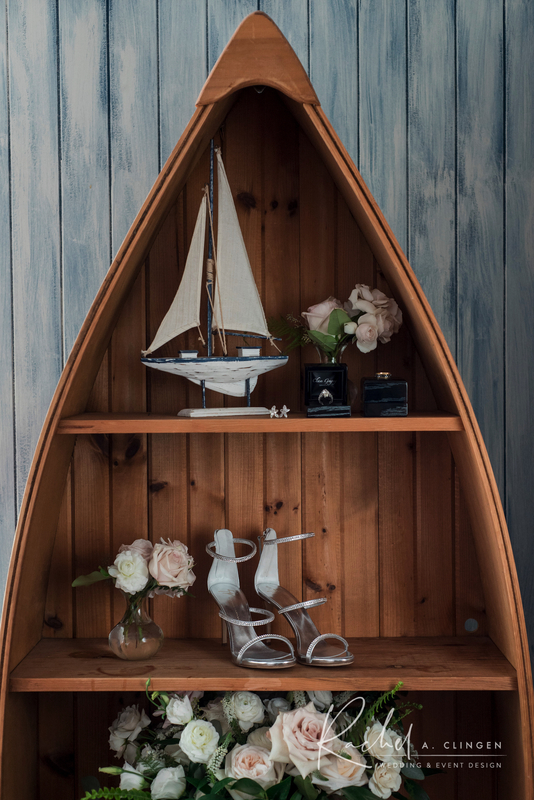 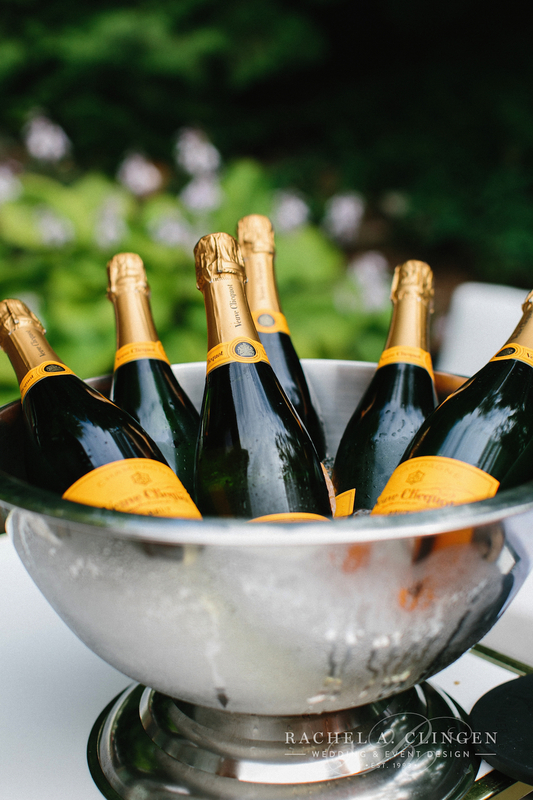 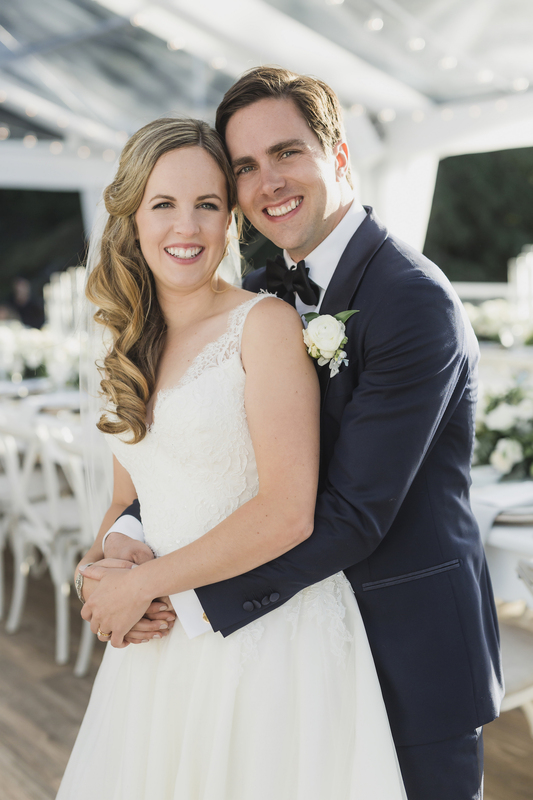 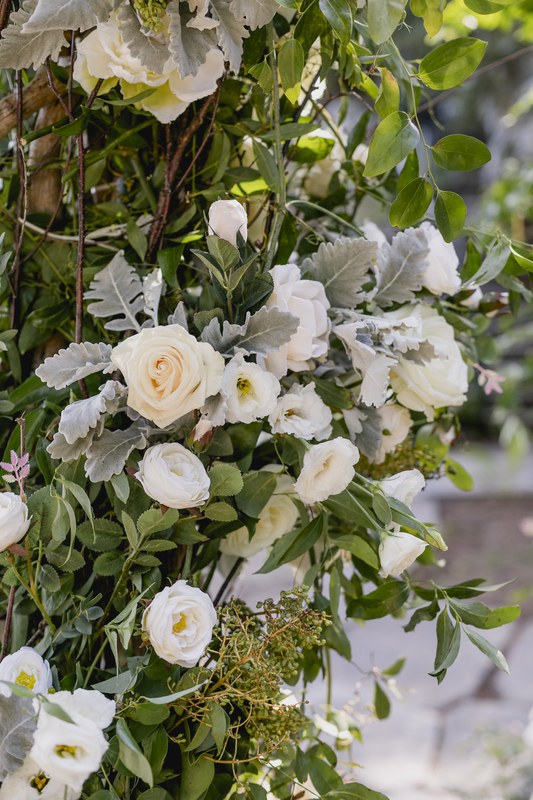 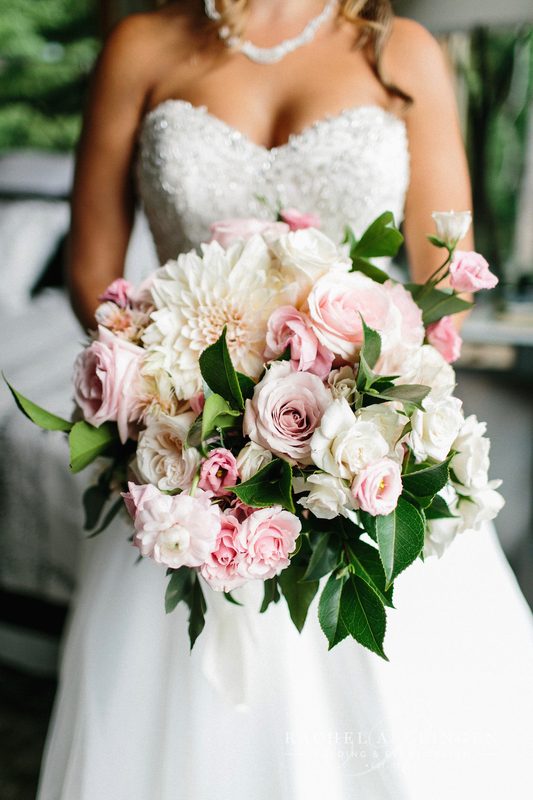 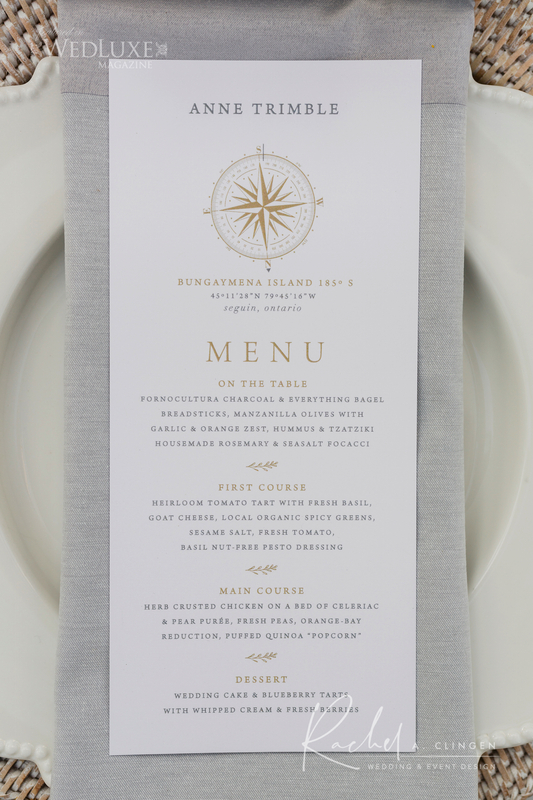 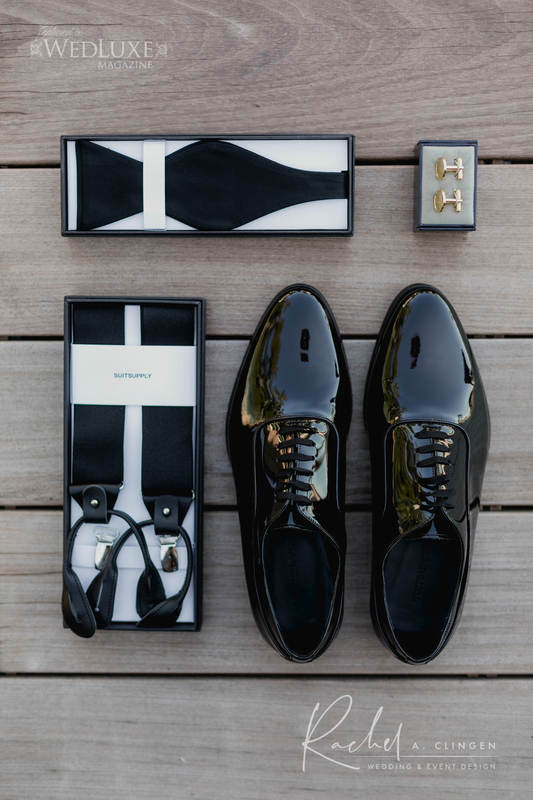 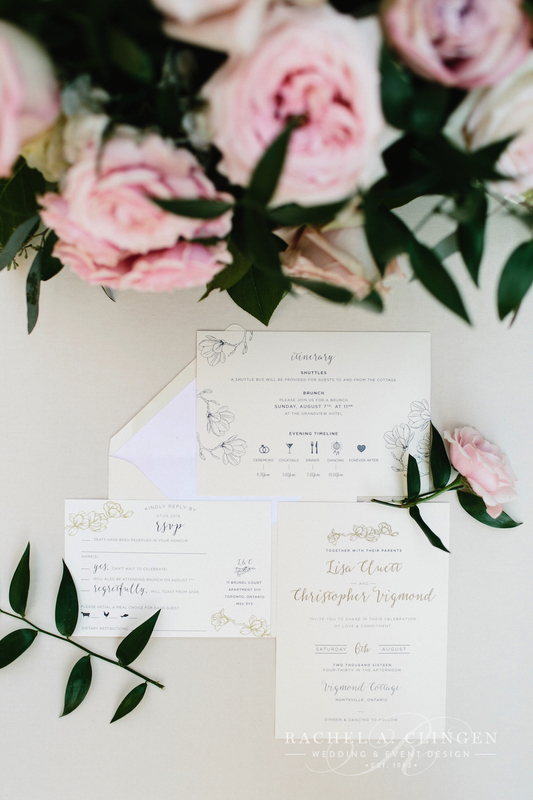 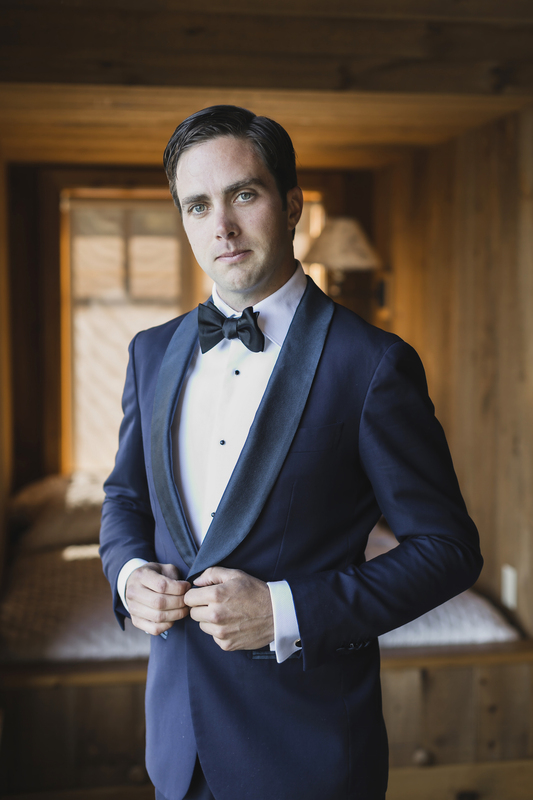 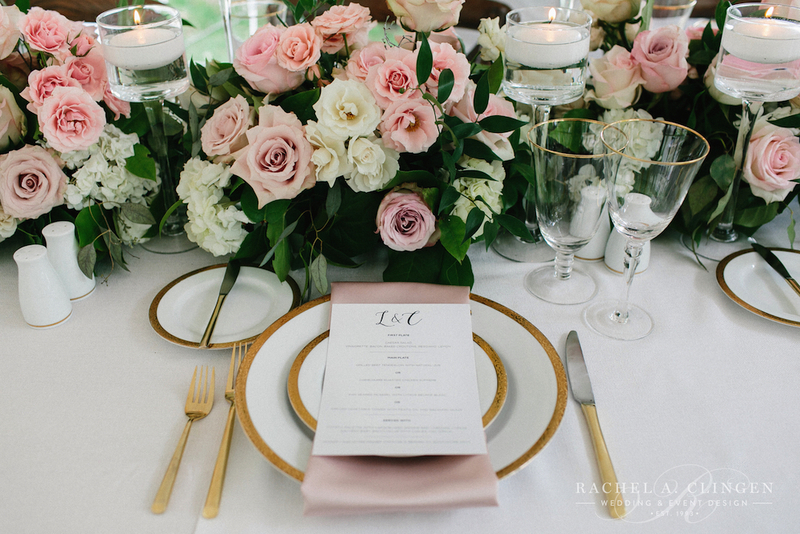 We worked closely with the couple to design the wedding of their dreams. 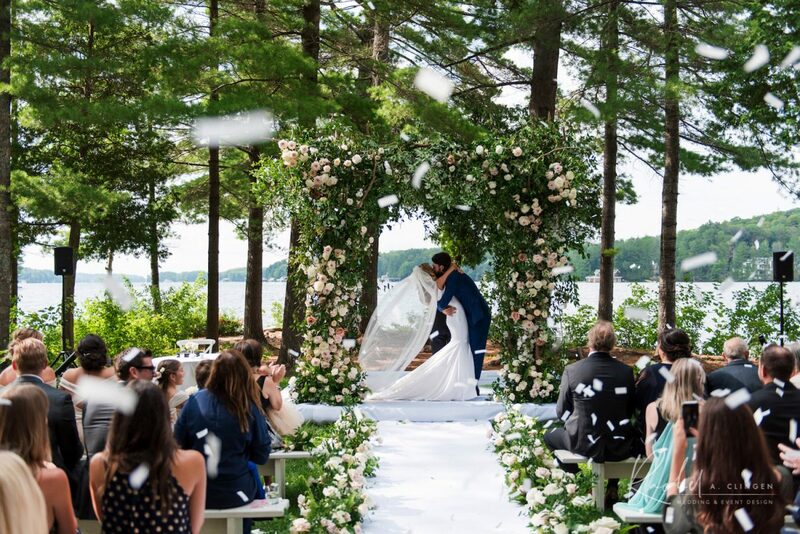 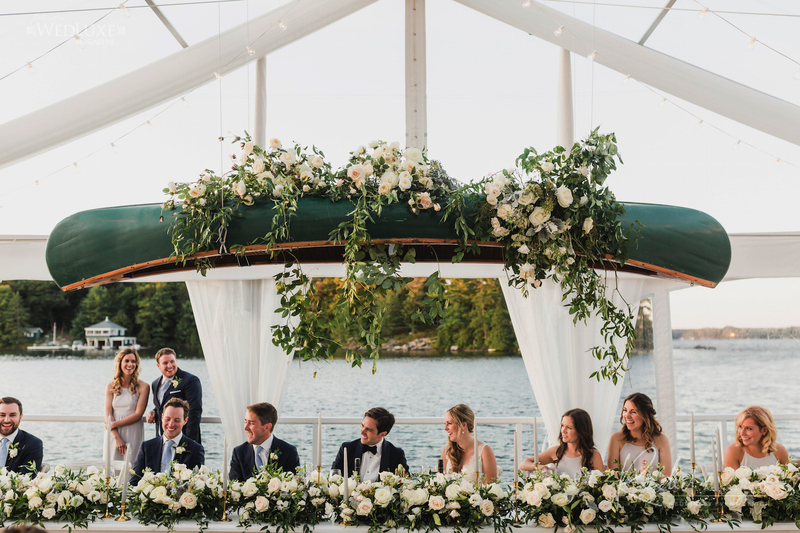 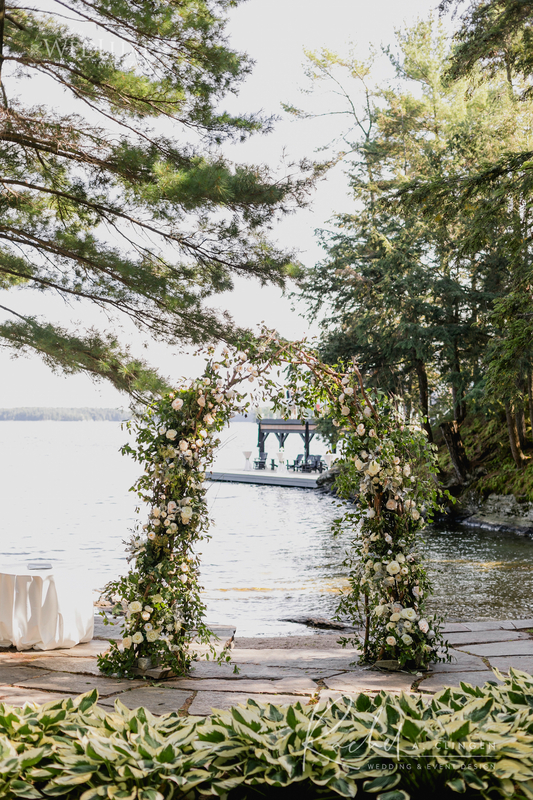 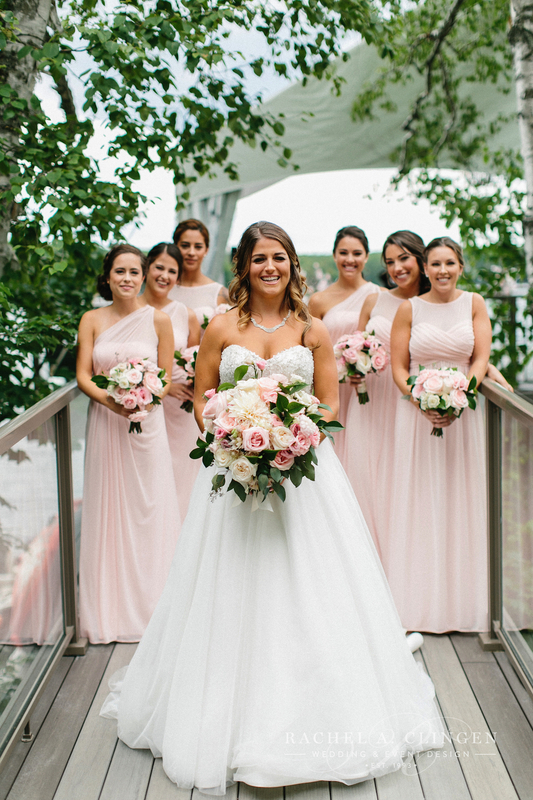 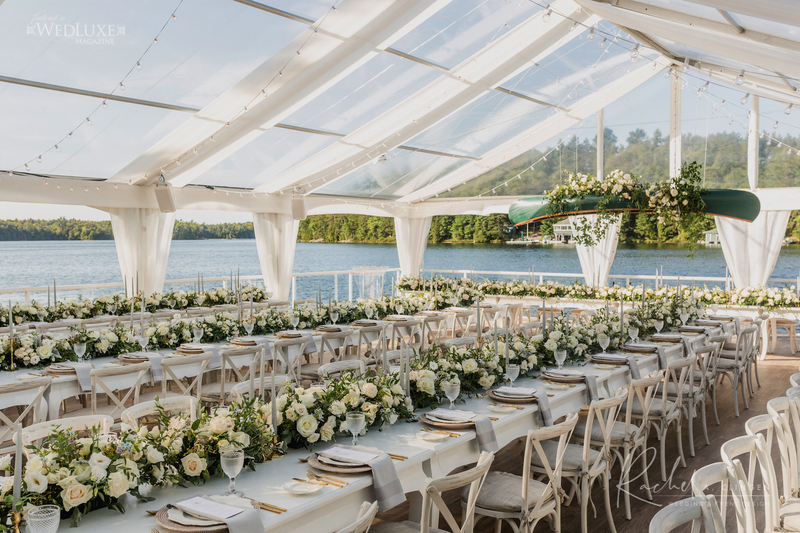 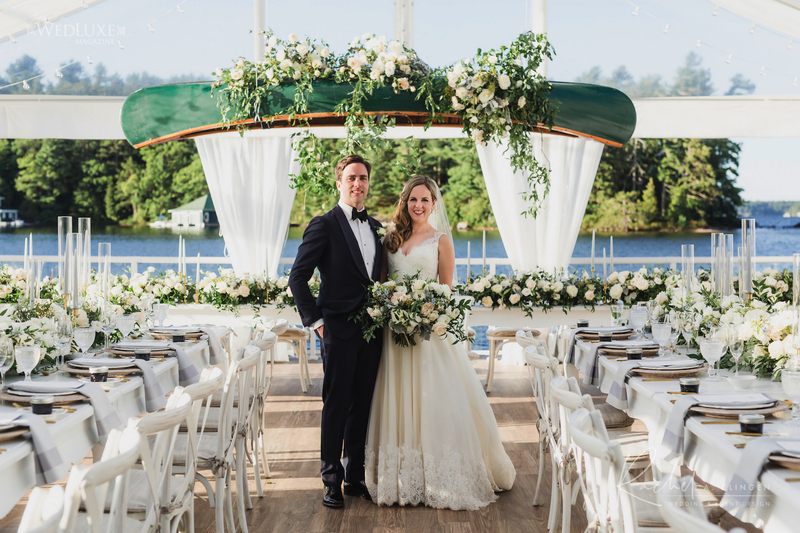 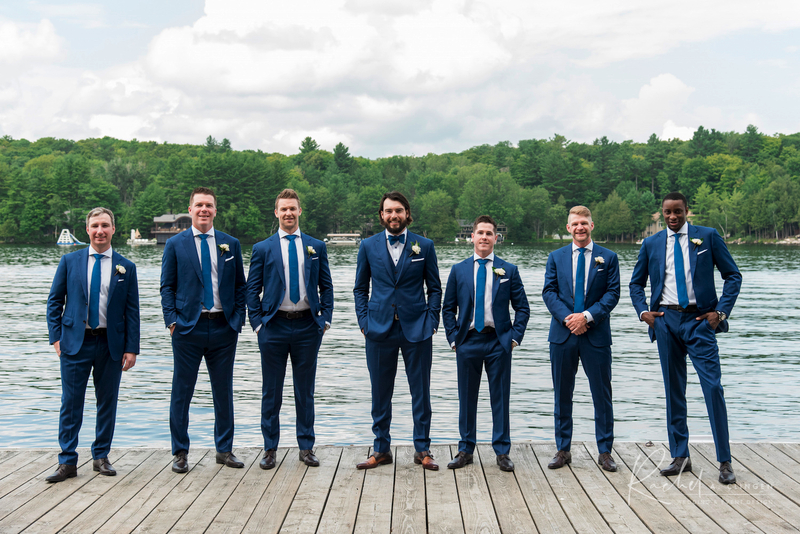 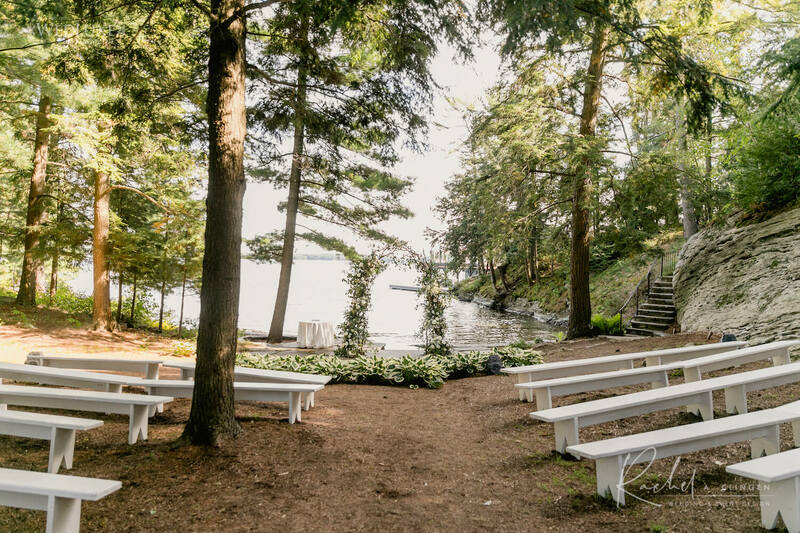 The ceremony took place on top of the stately boathouse which over looked the beautiful Muskoka lake in Huntsville, Ontario. 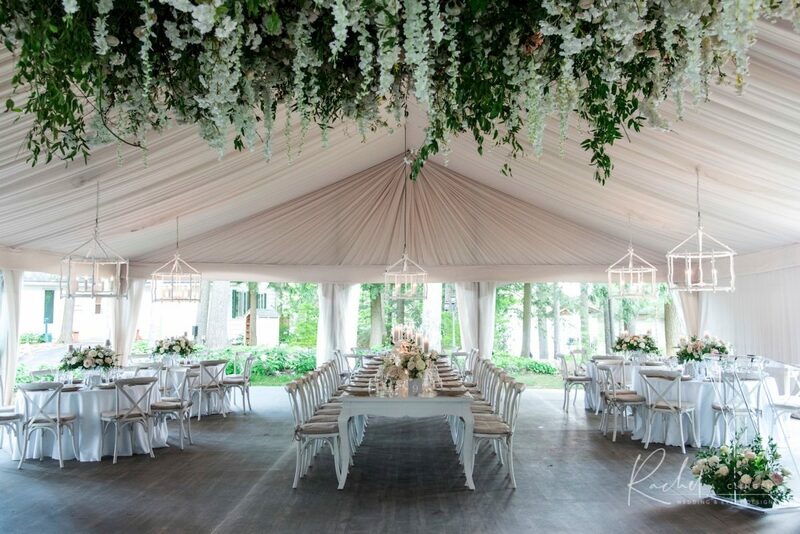 The decor was elegant but not stuffy. 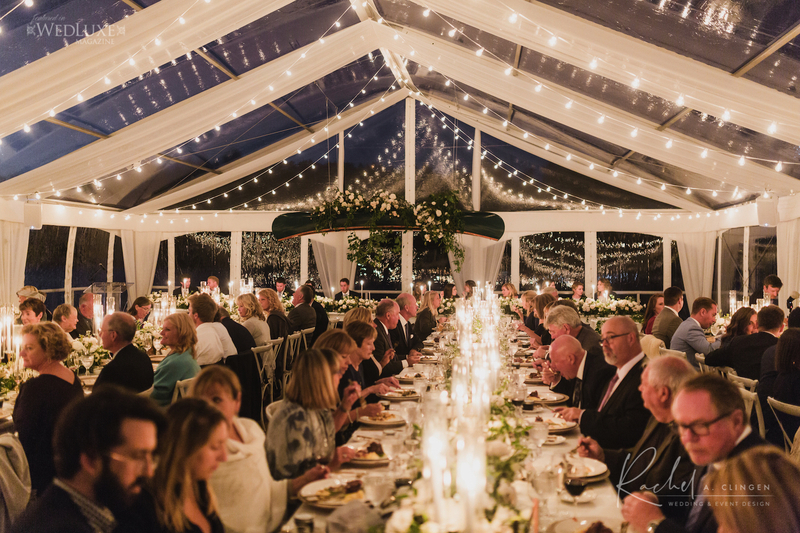 Lisa and Chris wanted guests to feel at home. 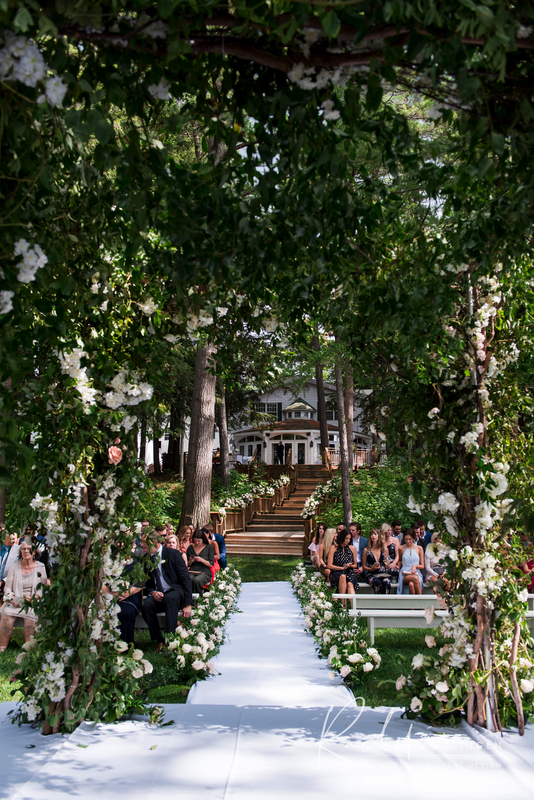 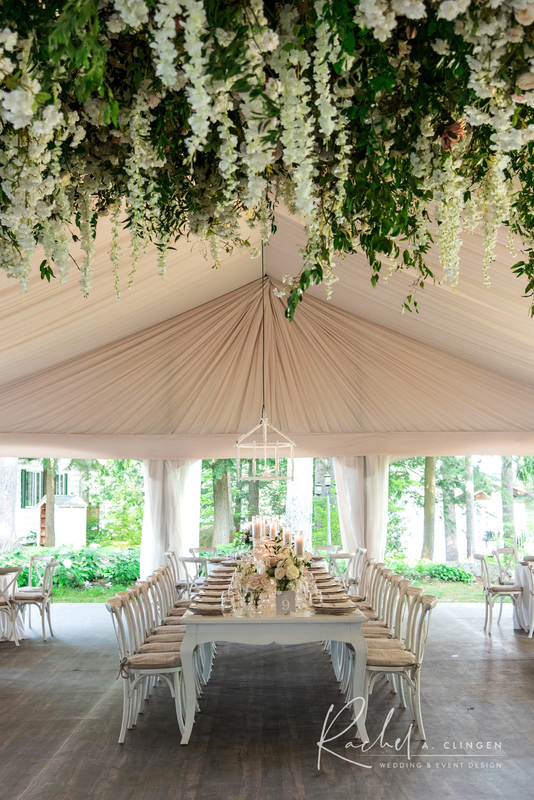 We designed a beautiful magnolia and branch canopy feature that was suspended over the dance floor. 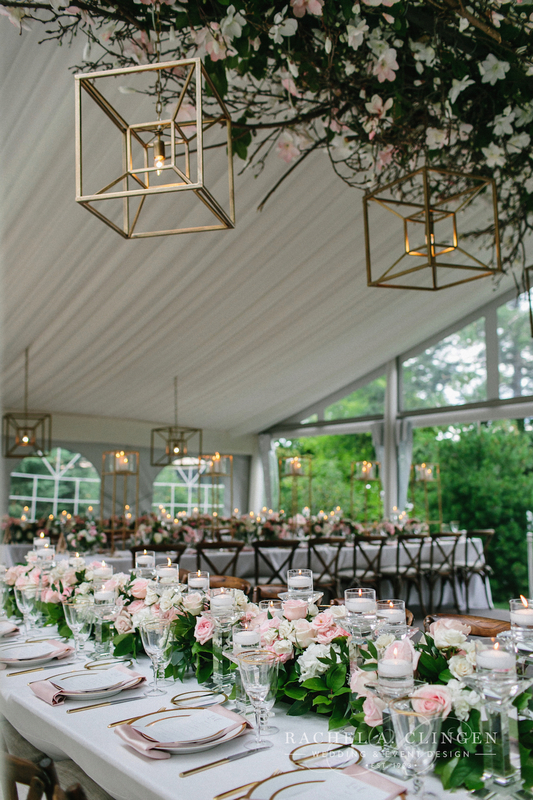 The mix of branches and florals Guests dined at gallery tables which were detailed with alternating rows of centrepieces. 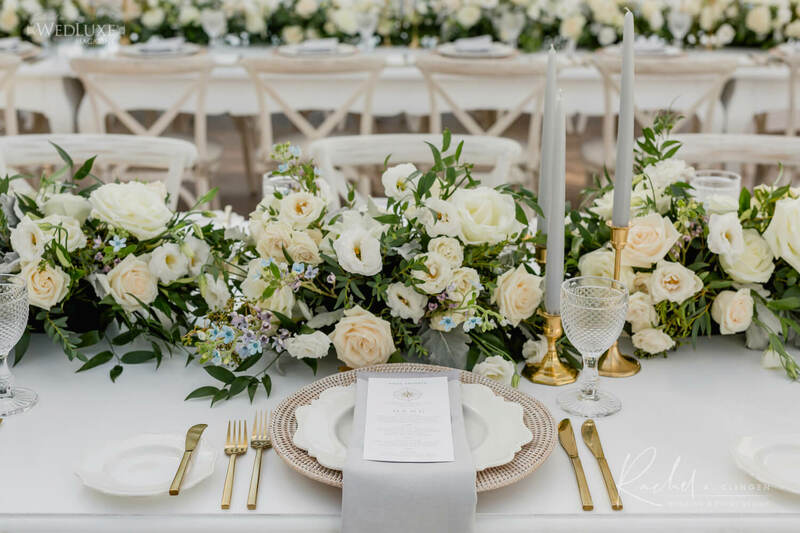 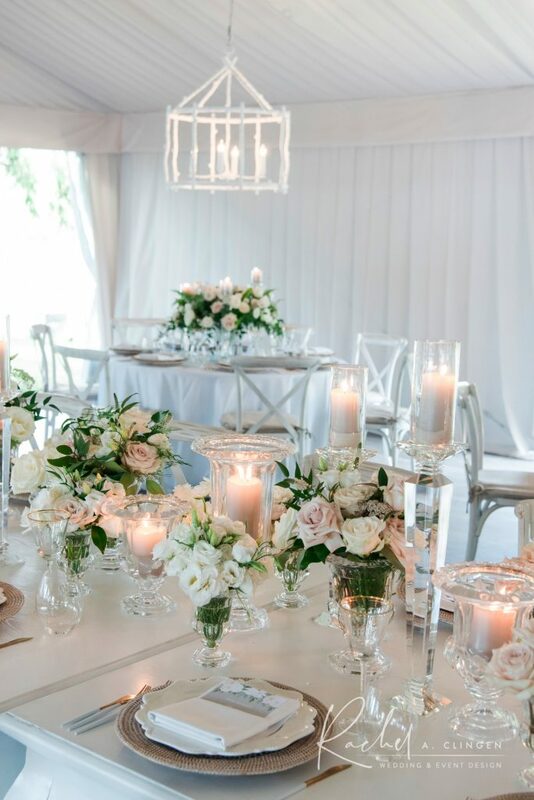 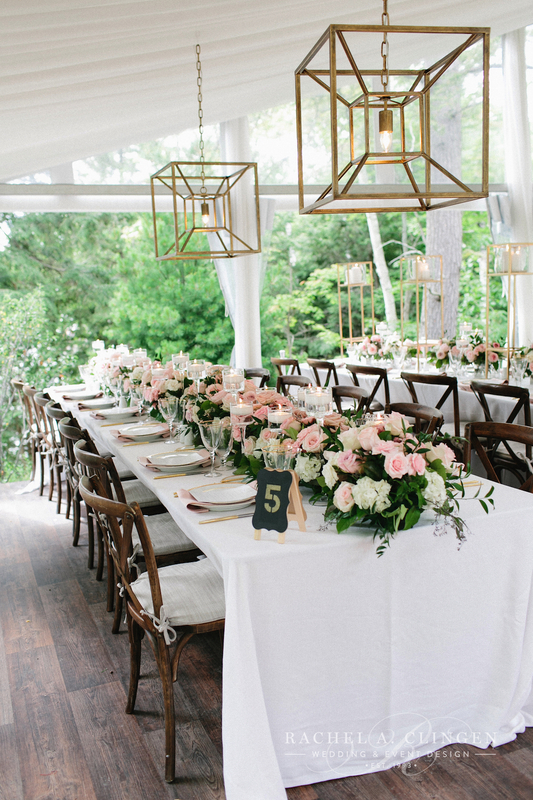 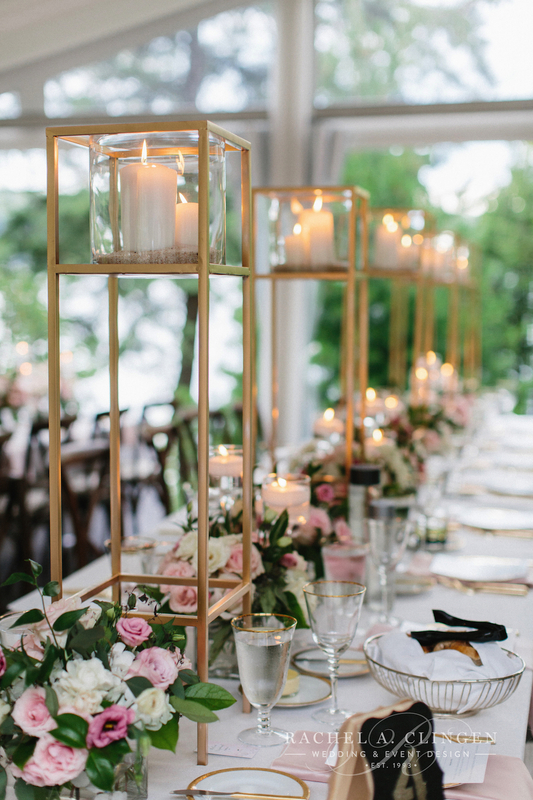 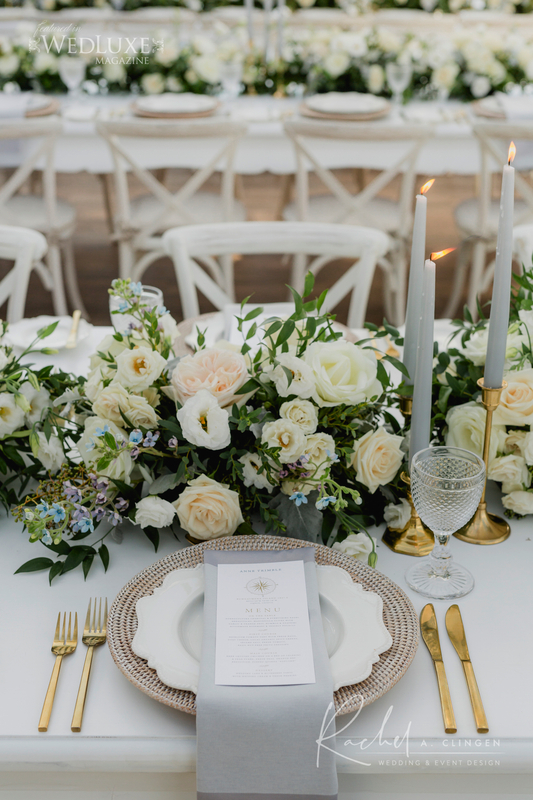 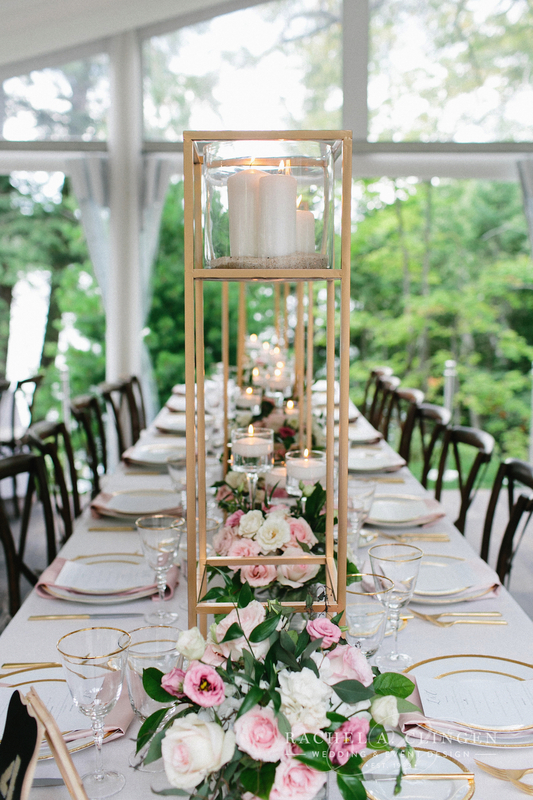 Tall modern gold stands with candles lined the tables along with low rows of pink and cream flowers. 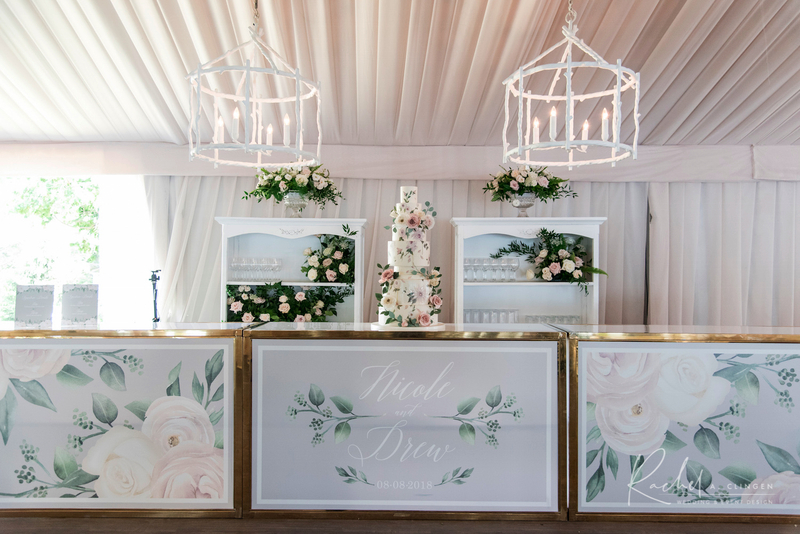 After the reception, guests would enjoy a fabulous desert station in the boat house. 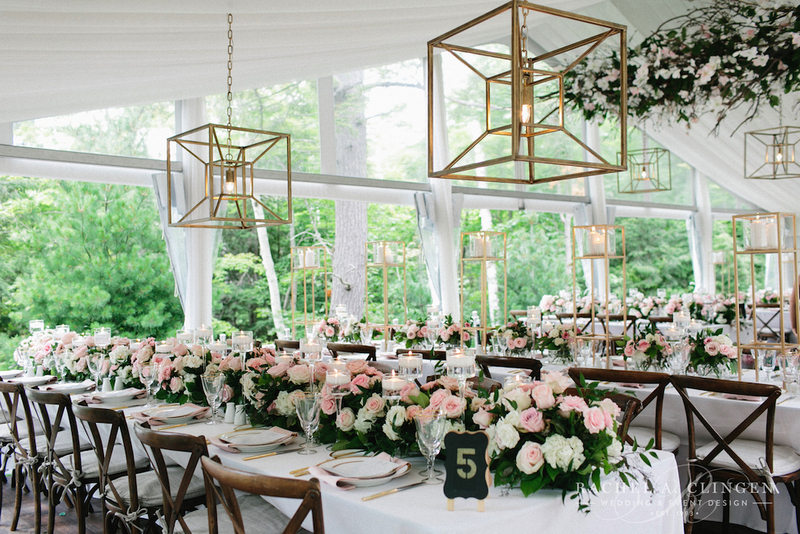 Our modern gold square chandeliers added soft lighting and a modern touch. 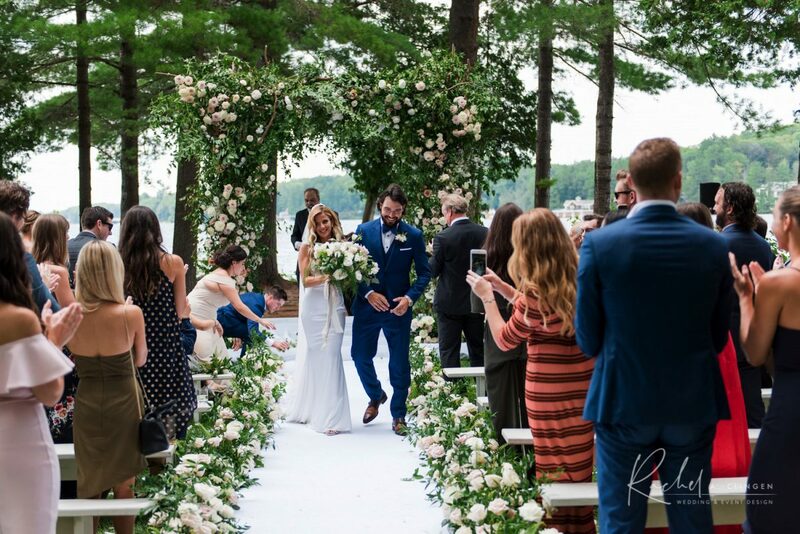 This beautiful Muskoka Tent Wedding created beautiful memories for Lisa and Chris and we are so thankful to have participated! 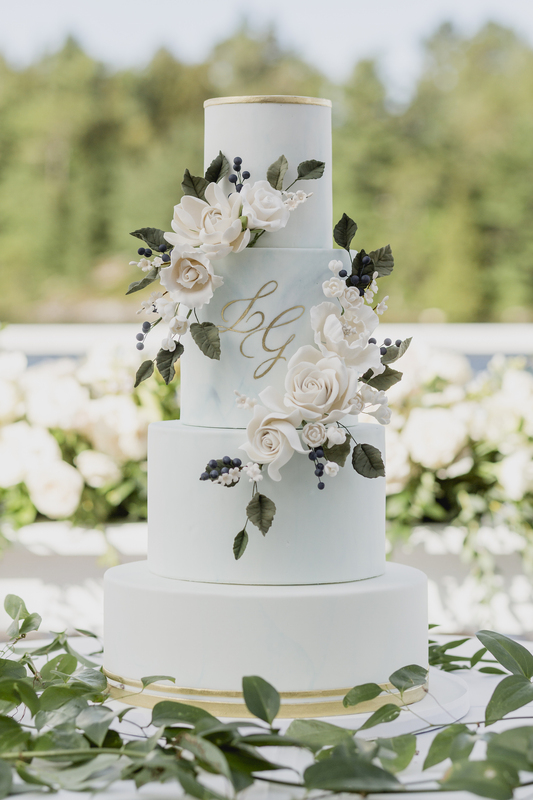 Special thanks to Cravings Fine foods for working so closely with us on this assignment as well as Jennifer Van Son Photography for sharing these beautiful images with us!